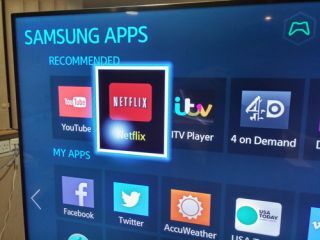 Samsung launches first Smart TV app with PayPal payments | What Hi-Fi? Samsung has added Karaoke Superstar to its Smart TV App store – the first Smart TV app to support payments through PayPal. The Karaoke Superstar app brings over 2,000 karaoke videos to your Samsung smart TV allowing you to sing along as the video plays. We're sure you get the gist. But the inclusion of the PayPal payment facility for the first time in the UK is arguably more interesting. Users can instantly buy a 'four-hour party mode' for £4.99 or pay £9.99 for a monthly subscription with unlimited access. With PayPal's reach spreading far and wide online, the potential for more shopping apps allowing you to buy goods and services through your Smart TV is obvious. Karaoke Superstar joins the likes of LOVEFiLM, BBC iPlayer, YouTube, Facebook and Twitter on Samsung's Smart TV hub.